Measurements around largest part of my tummy: 35″ – I’ve gained 2 inches around my middle since 4 weeks ago! Measurements around smallest part of my waist: 31″ – up 1½ inches from last time. Earlier this month I had a nasty cold and stomach bug. Not fun on top of other pregnancy woes. And then, I contracted a yeast infection. Perfect. Thanks to advice from our awesome midwife, I was able to cure it naturally. I haven’t been exactly steady with my exercises this month. What with sickness and being busy I kinda got out of the routine. So I’ve decided to start a regimen where I workout every weekday that I can. That ensures that I’ll get at least SOME exercise in each week. You’re SO cute. :) Blessings on your pregnancy! 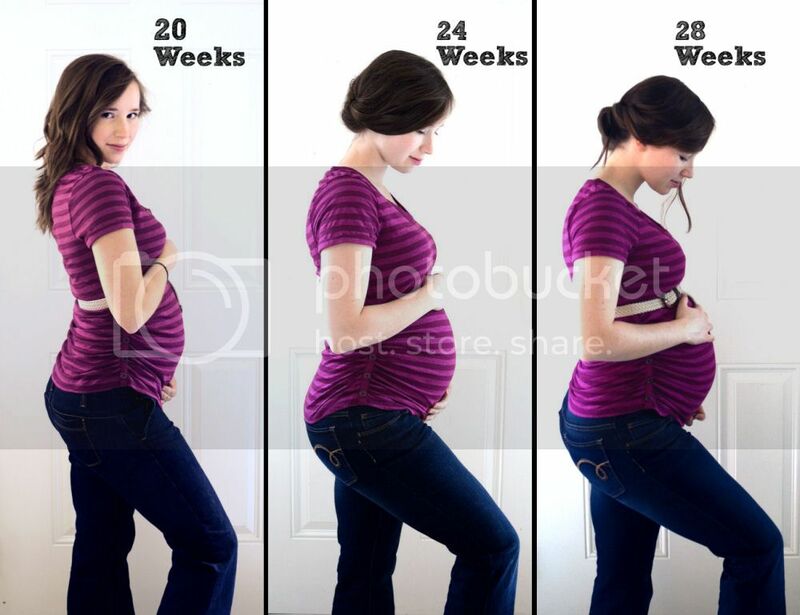 Your body will snap back to it’s slender self fairly soon after you give birth. So try not to perseverate on gaining weight or the numbers. You are getting as big as you need to in order to care for this little life inside of you. Stretching would help you as well and walking. But make sure you eat enough on top of burning calories! First of all…You look lovely! My advice on strengthening your muscles in your lower back is to lie on your back and just put your bum up, you probably know the exercise already, but it’s the best one. Having good back muscles is key, both during pregnancy, birth and after. You’re so cute :) i’ve heard from a lot of people that it’s impossibly hard to remember that when pregnant, but… you’re so adorable!! Your ligaments are starting to prepare for the birth of the child (and that is part of the lower back/pelvic pain) and will start to ‘loosen up’ so you can deliver the child. I popped my hip out of joint by sitting on the floor when I was about as far along as you and limped for a week or so after. You’ll lose all the weight in a flash after you have the baby. It’s a lot of work to give birth! I only had about 8 pounds to lose aferward and that came off with breastfeeding—and then some. Make sure you eat enough and don’t worry about your hips. You aren’t going to look exactly the same as before the baby, but pretty close and sometimes better! You are sooo adorable! I’m 6 weeks along and debating home birth. I’m meeting with one in St. Cloud tonight to get more info and ask questions. I noticed you said you have a midwife – are you having a home birth by chance? Thanks for sharing!! Hi there, you are such a cute pregnant lady! I’m currently 37 weeks pregnant with my 2nd, and can sympathize with what you’re feeling. Seeing numbers on the scale you’ve never seen before, having hips expand as well as belly, as well as (ahem) other areas. I’m speaking to myself as well as you when I say that it truly is pregnant, and not fat. My husband has to constantly remind me, as well. Especially in this last few weeks as I wait to meet my new little one. Just remember that you, and your beauty is defined by so much more than the number on the scale, or how your jeans fit your hips. Oh! And a P.S. I’m glad to see that you’re using a midwife. I did and had a waterbirth with my first son, and will be with this baby as well. It was a wonderful experience. You’re so beautiful. When I get pregnant one day, I hope to look as good as you do. I had a lot of that low low SI joint pain and all I can offer you is sympathy. Mine always seemed worse after stretching or while going for walks. As for your hips widening… I had success wearing the ShrinkxHips belt for 6 weeks after delivery. It guides your hips back to their pre-baby position while the relaxin hormone is still present in your body. Best wishes to your growing family!